"I do have a loop of cables that come out just for this pedal. This is the only and actual pedal that signal is coming out to and back during the show. It's in one of the loops, so it only comes on when he's using it, and that's for the intro to 'Lonely Boy.' It's the Super Shifter and he uses the Tremolo arm. We took the analog appraoch because you have to step on the pedal itself to actuate it. There's no remote. It does have an expression pedal jack, but you'd have to have another expression pedal to make it work. And if you step on the pedal it just dips the signal an octave and it comes back up when you release it. It's so much easier to do it that way. That's the way it was designed in the first place. So for that riff I have a buffered signal that comes all the way out here to this pedal and all the way back to the rig. It just comes on when he plays that riff and then we move on to a cleaner signal path. I'm just trying to keep all the time available his straight-into-amplifier sound because anything that you put in the path of that is not through bypass or splitters. Splitters usually buffer, although the devices we're using don't. They just transform or isolate splitters. So it sounds exactly like if you had just plugged into the amp," explains Dan Auerbach's guitar tech about the Boss Super Shifter PS-5. According to *Gear Secrets of the Guitar Legends: How to Sound Like Your Favorite Players*, Satriani used a PS-5. "Hamilton runs all of his pedals in front of the amp and controls the rig with a Custom Audio Electronics RS-5 MIDI Foot Controller designed by Bob Bradshaw. The signal starts with a Hello Kitty-modified Fryette Valvulator before going into an MXR Custom Audio Electronics Boost/Overdrive. From there the signal hits a Real McCoy Custom wah, Eventide TimeFactor, MXR Bass Octave, Boss PS-5 Super Shifter…"
In this Rig Rundown YouTube video source you can spot the Boss PS-5 pedal at 17:07. According to Boss' website, Pittman uses the Boss PS-5 Super Shifter pedal. This pedal is mentioned in this interview for Boss: "What BOSS pedals get the most mileage onstage?" "The delay [DD-3] is a favorite, the overdrive [OS-2], and more and more the pitch shifter [PS-5]. I prefer the DD-3 onstage, but for recording I use the DD-6." "**Interviewer:** What kind of gear did you use during the recording process? **Bouillet:** Guitars used where FGN Fujigen Expert OS, 1978 Les Paul Standard, 1978 Ibanez Pf 300. Pickups Seymour Duncan JBs, Intex Cables which I highly recommend, Dunlop picks, Marshall, Mesa Boogie, Roland Micro Cube amps, Eleven. Boss Gt 100, Boss Super Shifter, Vemuram Triplex, Line 6 delay, D'Addario strings, Pro Tools. Neve 1073's, RCA pre's, V76's Shure 57's." In this interview with Seymour Duncan, Ray says "I just have a Dunlop Crybaby wah, Boss EQ pedal, Boss Pitch Shifter to do harmonies, Boss Chorus Ensemble, and Electro-Harmonix POG Polyphonic Octave Generator"
*Mix Online* breaks down what gear members of Florence and the Machine use, mentioning that one of Mark's pedals is the PS-5. [Source](http://www.mixonline.com/news/tours/all-access-florence-and-machine/368254). "The Super Shifter I use for like a bomb note. It sounds like an explosion." In this detailed gear diagram of Munky's Korn stage setup, you can see the guitarist used a Boss PS-5 Super Shifter pedal in his 2002 guitar rig. En este video en el minuto 2:26 explica que uso tiene el pitch shifter en la pedalera. Nice Rack Canada custom builds this pedalboard for St. Vincent. This two part pedalboard also houses a Boss PS-5 SUPER Shifter Pedal. [Source](http://nicerackcanada.com/st-vincent-2014-annie-clark/). *Paste* magazine interviewed 16 artists about the effects they use. 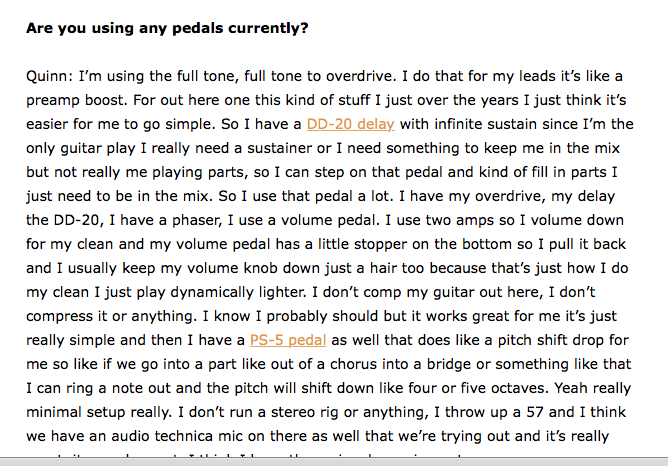 Todd mentions in [this article](http://www.pastemagazine.com/blogs/lists/2012/05/14-guitarists-talk-about-their-pedal-boards.html) that he uses a Boss PS-5 SUPER Shifter Pedal. In this photo posted by Fairchild, the Boss PS-5 SUPER Shifter is visible. Mr. Vincent Accardi uses the Boss PS-5 Super Shifter Pedal on his pedalboard. 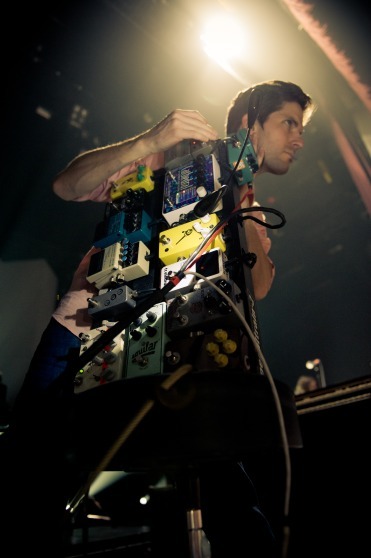 In this photo, Boss PS-5 Super Shifter is visible in Skjelset's board. A Boss PS-5 SUPER Shifter Pedal is shown on this Guitar Geek diagram of Herman Li's rig. "We’ve been experimenting with new stuff lately, but right now my effects include Boss PS-5 Super Shifter…"
At 2:55 we get a clean shot of Colin Frangicetto's pedalboard, showcasing the Boss PS-5 Super Shifter on the top row, three from the right. "I have a PS-5 pedal as well that does like a pitch shift drop for me so like if we go into a part like out of a chorus into a bridge or something like that I can ring a note out and the pitch will shift down like four or five octaves…" Quinn Allman says, in [this interview](http://orangeampsblog.com/?p=108). "a pair of Boss PS-5 Super Shifters (one goes up and one goes down so he doesn't need a whammy bar)." According to this photo, Wilson also uses Boss PS-5. 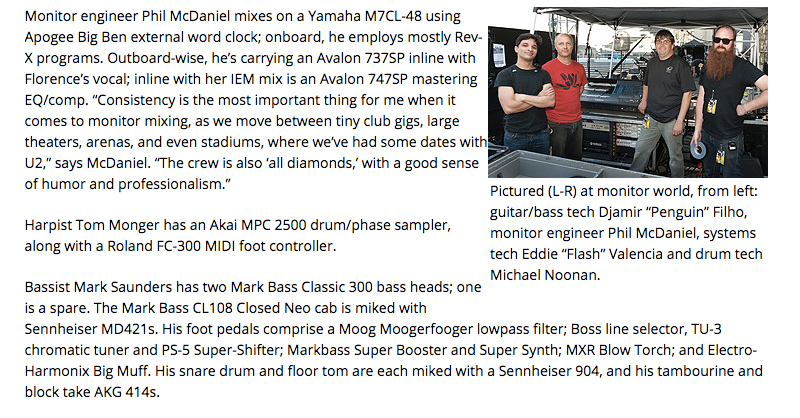 According to this article about gear seen being used by Lockett Pundt, he has used a Boss PS-5 Super Shifter pedal, but the picture on the website does not match the type of pedal. In this photo [(source)](http://www.sourceaudio.net/artists/detail/alex-grossi), the Boss PS-5 SUPER Shifter can be seen. Jesse uses a mod version of this pedal. In a 2013 video, Mark shows a rundown of his gear beginning with his pedalboard. Mark uses 2 of these pedals, which can be seen at the 0:21 mark. These pedals are used in conjuction and can notably be heard in the Nothing More song, "Jenny". According to 2008 Guitar Geek's rig diagram, Money uses the Boss PS-5 pedal. Concert pictures from 2014 show this pedal being used by Marissa. According to an article on Guitarthai, in addition to his own signature ESP Eclipse lineup, Sugizo also used an ESP Horizon, Fender Jaguars, Fender Stratocasters, Fender Telecasters, Gibson ES175, a Gibson Les Paul Custom, a Richenbacker 330, and electric violins made by Kranz. He also used Diezel VH4 head, a Mesa Boogie Dual Rectifier head, a Mesa Boogie 4x12 cabinet, a TC Electronic TC 2290 Rackmount Dynamic Digital Delay, Decimator ProRack G power conditioner, a script Phase 90, a Boss CE-2 Chorus pedal, a Boss OD-1 pedal, a Providence Final Booster, a Digitech Whammy II, an Eventide Pitchfactor, an Eventide TimeFactor, an Eventide ModFactor, a TC Electronic G System, a Boss PS-5 Super Shifter, a Blackstar HT-DIST Distortion pedal, and a Providence Stampede Overdrive. The switcher controls a Fuchs Royal Plush compressor, a Morley Steve Vai Bad Horsie Wah, a Radial Engineering Tonebone Classic, a Marion Henry Electric Fuzz Bucket, a Moogerfooger MF-104M analog delay, a BBE MB-2 Mind Bender vibrato/chorus, Boss PS-5 Super Shifter and PH-3 Phase Shifter pedals, a Source Audio Soundblox 2 Orbital Modulator, a Malekko Omicron Fuzz, a Guyatone MD2 Micro Digital Delay, and a Banzai Cold Fusion Overdrive that he compares to a Klon Centaur and says is key to his sound. picture of johnny's pedal board Morley Boss Digital Delay DD-? Volume Pedal? Afterneath Ghost Echo Overdrive Boss Blues Driver BD-1 ?? Boss Super Shifter ? ?-1 Boss Chromatic Tuner ??-? This photo was taken on 2013 HEALTH concert in London. In this photo of Famiglietti with his pedalboard, one of the pedals in the pedalboard is the Boss PS-5 Super Shifter. 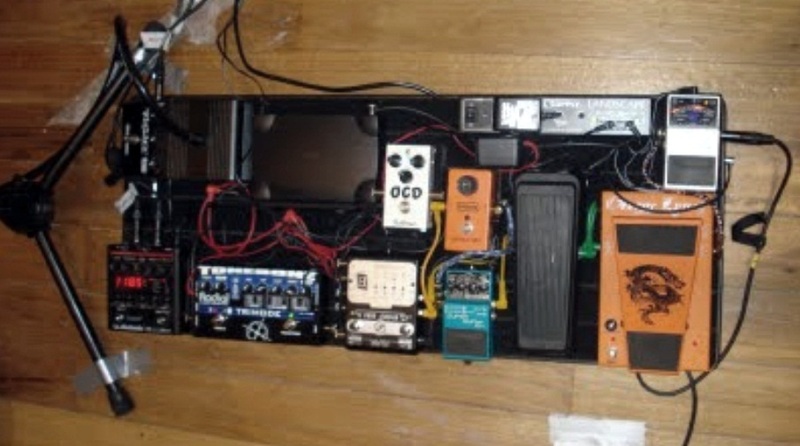 In Pedals Fusion's interview with Atsuko Chiba, David showed off his pedalboard, which included a Boss PS-5. Nathan goes over his entire pedalboard over the course of five videos, as well as a post by Pedals and Effects on their website, the Super Shifter is the third pedal in the third video. 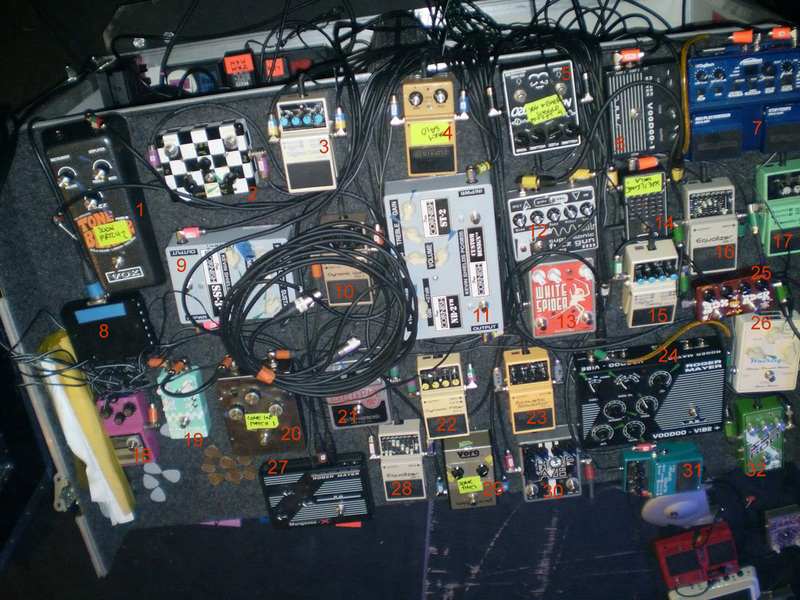 This image of Lee's pedalboard shows his Boss PS-5 SUPER Shifter Pedal. He uses PS-5 with saxophone. Why do you need a whammy for ? This is a great pedal with a bunch of great features : Harmonist, Pitch Shifter , T. Arm (whammy thing), Detune (more than a chorus) and flutter (the heck is this ?). Give it an expression pedal and you're ready to go ala Morello. The sound and build quality are phenomenal (yes, i'm a Boss fan). Just go for it ! Not the best pedal for harmonies and pitch shifting as the pog 2 is, I would use this to switch pitches with the t-arm. how's the detune handle chords?